One thing we really appreciate is that the tap to compose box is much bigger - as big as can fit on the screen, no more viewing only 2-3 lines of text from your message. You can use S Voice to dictate your message or use Google's built-in voice recognition software if you don't feel like typing. If the latter is often the case, Samsung provides the option to change the input methods. When you're composing a new message you can use the Translate option to translate it into another language. The same goes for messages you've received. This feature probably won't see much use but it's there should you ever need it. What will come in good use, however, is the new Direct call feature. When you are reading a message from someone, their number will be automatically dialed by just lifting the phone up to your ear. The Galaxy S Relay 4G also features a combined inbox, which brings together all your mail in a single folder. This can be quite handy if you have lots of accounts and you just want to check if there is a new message needing your attention. 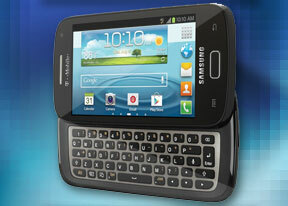 Text entry is handled by the standard Samsung QWERTY keyboard, which offers big and comfortable keys. Of course, you have that hardware QWERTY at your service. The Samsung Galaxy S Relay 4G comes with the default ICS Gallery. It opens up in Albums view, which is what we're used to seeing - it lists all folders with photos in the phone. Rather than the familiar stacks, the app uses a grid of photos, two on a line. Besides, Album view, photos are sorted by Location, Time, Person (photos with tagged faces) and Group. Getting inside an album displays all the photos in a rectangular grid, which is horizontally scrollable. When you try to scroll past the end, the photo thumbnails will tilt to remind you you're at the end. When viewing a single photo, you'll find several sharing shortcuts and a delete button above the photo, while below is a line of small thumbnails of all other photos in the album. You can tap those small thumbnails to move to other images or you can just swipe to the side. When viewing a photo with people's faces visible in it, the Galaxy S Relay 4G will try to detect them automatically (and you can manually highlight faces where it fails). Buddy photo share will use your contacts' profiles to try and recognize who is who automatically. Social tag makes sure that whenever a face is recognized in the photo, their status message appears and you can easily call or message that contact. The Samsung Galaxy S Relay 4G uses an updated version of the TouchWiz music player. Samsung has enabled equalizer presets (including a custom one) along with the sound-enhancing SoundAlive technology, which features 7.1 channel virtualization. Samsung uses SoundAlive in some of their MP3 and Android-powered media players. The Galaxy S Relay 4G player is DLNA-enabled, so you're not limited to tracks on your handset - songs on devices connected to your Wi-Fi network are as easy to get to as locally stored songs. Samsung have put what is easily the best default video player on the Samsung Galaxy S Relay 4G. It offers several view modes - grid, list, folders and nearby devices (which accesses DLNA devices). The grid view is our favorite - the visible video thumbnails (all eight of them) are actually playing the videos instead of being static images. They play at a reduced framerate, but it's an awesome preview and it shows what can be done when you have processing power to spare. The video player lets you choose between three crop modes for how the video fits the screen. The same SoundAlive audio-enhancing technology is available here too. Another cool feature that showcases the power of the chipset is the chapter preview - it detects chapters in the video and shows a rectangular grid, with live thumbnails (just like the grid view above). The video player had absolutely no trouble with any of the files we threw at it - starting with .WMV, through .AVI (DivX and XviD) and .MP4 to .MKV (H.264). Resolution wasn't a problem either.